On the topic of small business strategy, many of you know what it is and how to implement them. So, I have tasked myself with creating the simplest guide to small business strategy by explaining 5 essential approaches to strategy in the quickest way possible — dot points! Most familiar strategy. Taught in business schools. Believe that the world is predictable, competition is stable, and advantage is sustainable. Involves dog-eat-dog competition and red ocean strategies where firms seek to position themselves optimally within their market. Positioning is based on superior size, differentiation, or capabilities. Achieving all is extremely difficult. Analyse competitive advantage and the fit between firm’s capabilities and the market, and forecast how these will develop over time. Design a plan to build and sustain advantageous positions, and execute it efficiently. Business environment is neither predictable nor flexible. Predictions are difficult to make, and advantages are short-lived. Only defence against continuous disruption is readiness and adaptability. Winning comes from constantly experimenting and identifying newer options faster than others. Less analysing, predicting, and optimising. Select the most successful ones to scale up and exploit. When the environment changes, rapidly repeat the process in order to find the most advantageous option, and renew the advantage. About imagination, realisation, and creativity. Win by being the first to introduce a revolutionary new product or business model. Look to create a new market segment or disrupt an existing one. Can be the first to apply a new technology, or identify and address a significant consumer dissatisfaction or need. Can even create a new need! Also, can innovate to revitalise an old industry business model, or recognise a trend before others. Envisage a valuable possibility that is achievable. Be the first to build it. Persist in executing and scaling the vision to its full potential. Environment is unpredictable but mouldable. Shape or reshape an entire industry in its early stages of development. Need to collaborate with others, share the risk, contribute capabilities, and build the new market before competitors mobilise. Rely on collaboration more than competition. Engage stakeholders with a shared vision. Build and evolve a platform which collaboration can be orchestrated, by scaling and maintaining its flexibility and diversity. Aims to restore the vitality and competitiveness of a small business in a harsh environment. Can be caused by a mismatch between the small business’s approach to a strategy and its environment, or by an external or internal shock. Need to change the way of doing business, if the current one continues to fail. Recognise and react to the deteriorating environment ASAP, by restoring your viability: refocusing the business, cutting costs, preserving capital, essentially freeing up resources for the next chapter of your small business. Look to one of the other four strategies to rebuild the business’s advantages. Based on: Reeves S., Haanaes k., & Sinha J. (2015). 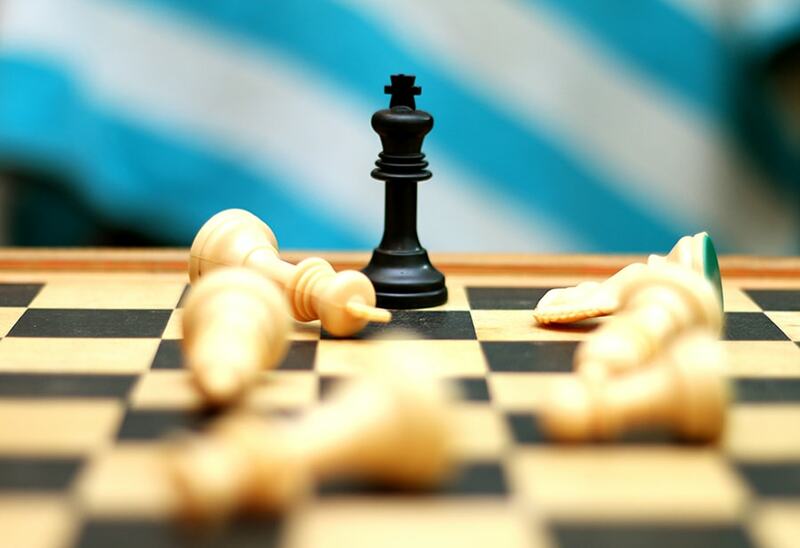 “Your Strategy Needs A Strategy: How to Choose and Execute the Right Approach”. 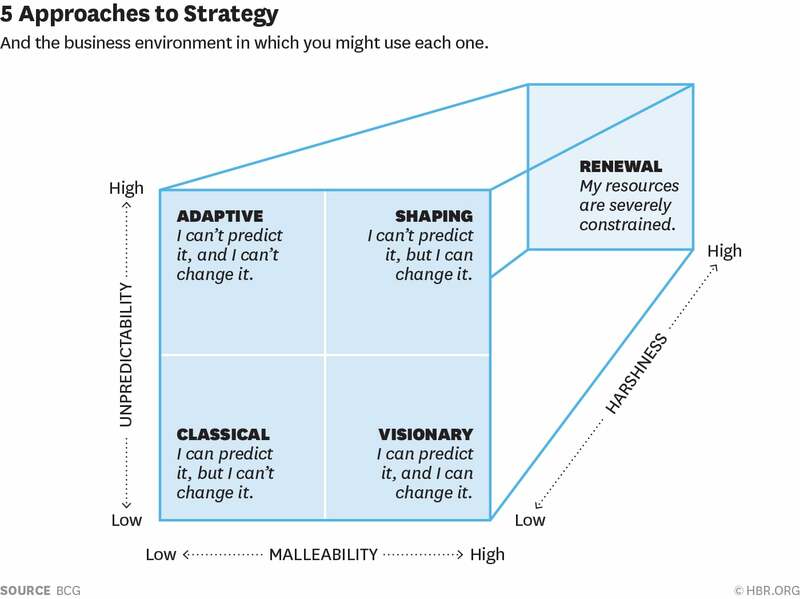 Harvard Business Review.